This year, the majority of Americans will dust off their good ol’ fashioned oven roasted turkey recipes and baste their turkeys to golden perfection. For those of you who have never considered cooking your Thanksgiving turkey any other way, you’re missing out on a world of variety . For starters, you could smoke it, grill it, even deep-fry it… Then of course there is the infamous Turducken, which we’ve never actually seen, only heard legends about. And what about Spatchcocked? Yeah, apparently that’s a thing. It’s easy to see how people can get overwhelmed by all the options out there only to fall back on Mom’s famous recipe. We decided that by applying some strategic analysis to this problem, we could clear up the options and inspire a little creativity this Thanksgiving. Let’s go. Check out the public project here (free account required). 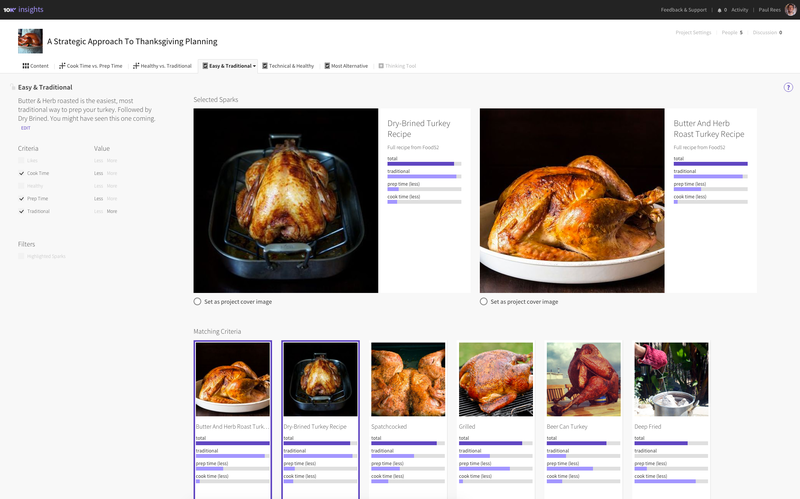 We loaded the top 11 Thanksgiving turkey recipes into 10,000ft Insights and used the built-in analysis frameworks to help us strategically evaluate each one. Below are screenshots and descriptions of the project. If you want to geek out with us on turkey 2x2’s and what-if scenarios, keep reading. Otherwise skip to the end to see what we found to be the Easiest & Most Traditional option, the Most Technical & Healthiest, and the Most Alternative Method. We began to understand the problem by researching the many methods out there for cooking the holiday bird. 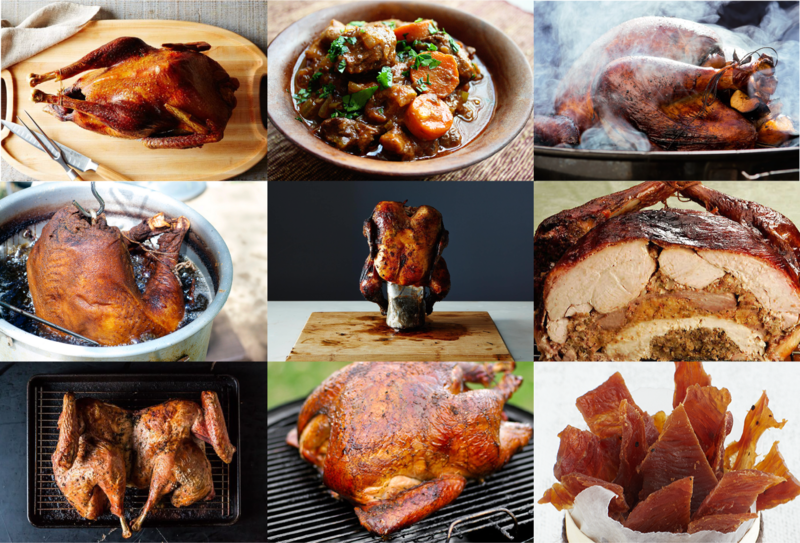 We decided to focus on 11 methods ranging from traditional oven-roasted, to beer can turkey, to turkey stew. We converted each method into a group in a 10,000ft Insights project. 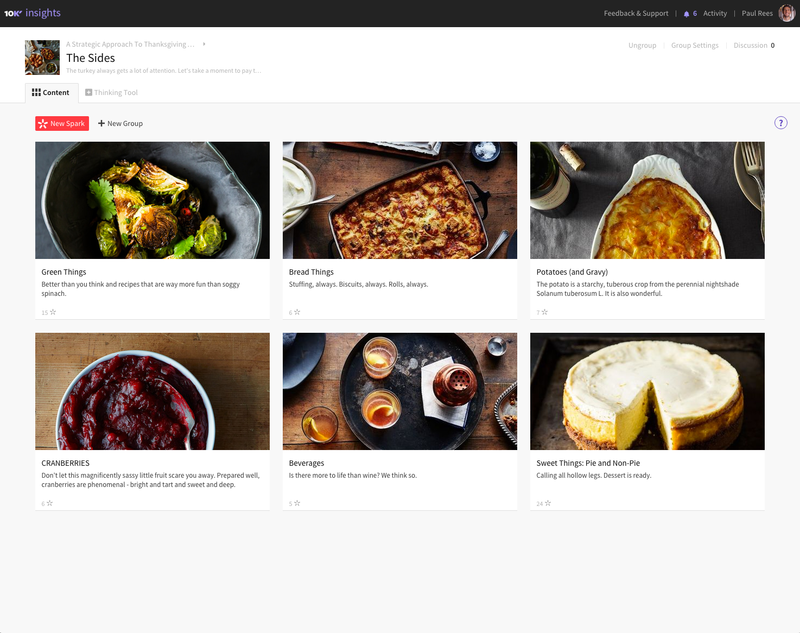 When you click into a method, we added step-by-step instructions to provide more details about the recipe and a link to the food blog where we found it. This helped keep our thinking and research organized. Next we decided on evaluation criteria to help us understand the strengths and weaknesses of each method. We created a 2x2 to compare Cook Time vs. Prep Time. 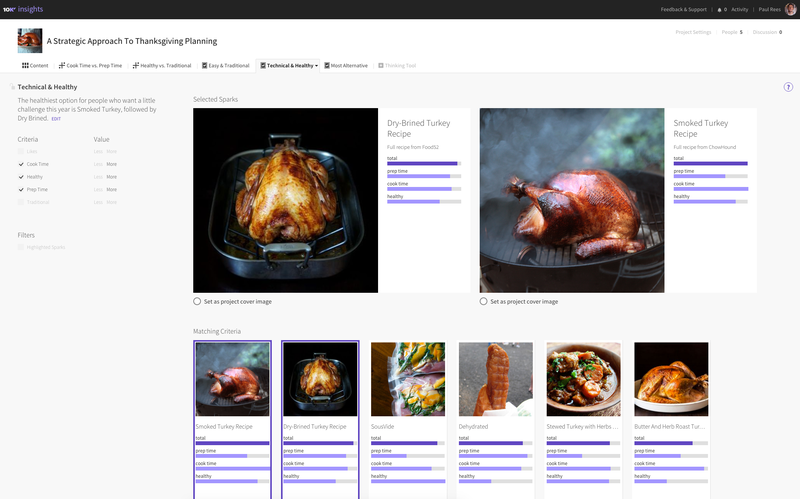 We thought this would give us a good understanding of what it would take to go from frozen bird to dinner served, and we knew it would have a large influence on which method we ended up choosing. Many of the methods have similar cook time — except for deep fried, which on average takes about 25 minutes! Prep time varied from 14.5 hours for dehydrated turkey, to 30 minutes for a grilled approach. Next we wanted to look at relative health value vs. how traditional the method was. As you can see, there is much more diversity for this one. Dry-brined and roasted led the pack on the traditional scale, with deep-fried and dehydrated on the other end. Sous Vide was the healthiest option up there, but also one of the least traditional. Finally it was time to choose a way forward. 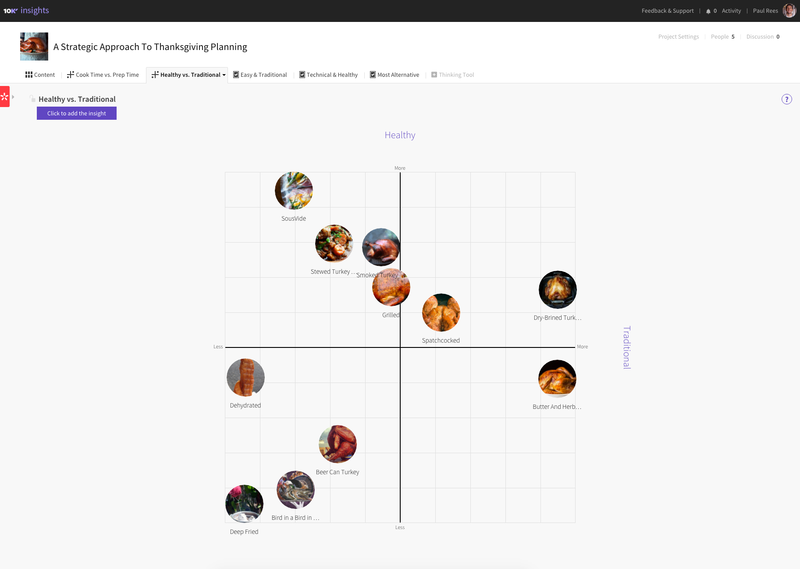 We realized that the outcome depends on what kind of Thanksgiving you are going for, so we created three decisions in 10,000ft Insights to synthesize our evaluation in three different ways. We found that the Easiest & Most Traditional methods were the dry-brined and roasted turkey recipes, due to their relatively low cook and prep times and high traditional qualities. The Most Technical & Healthiest options were the dry-brined (again!) and smoked recipes. This decision was based on wanting a challenge, so we were looking for higher prep and cook times, while keeping in mind a high health value. Then we got a little crazy and wanted to find the Most Alternative Method. We looked for high prep and cook times, and low health and traditional values. The results were dehydrated turkey jerky and the turducken. The next step in any strategic analysis is to test and refine your assumptions. Unfortunately for our purposes, our testing is going to have to wait until next Thursday, but boy are we excited for it. 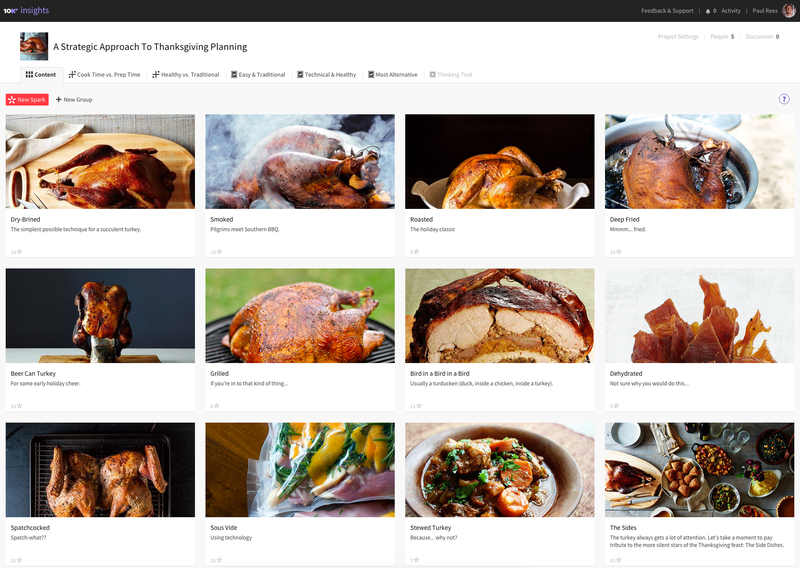 In addition to all the turkey prep methods, we added a group dedicated to Thanksgiving’s supporting cast: the side dishes. We curated green sides, potato dishes, variations on the common cranberry, and desserts (ah desserts) — of the pie and non-pie persuasion. If you’re not convinced by the alternative turkey methods, take a look at these ideas for side dishes to add some color to your holiday table. 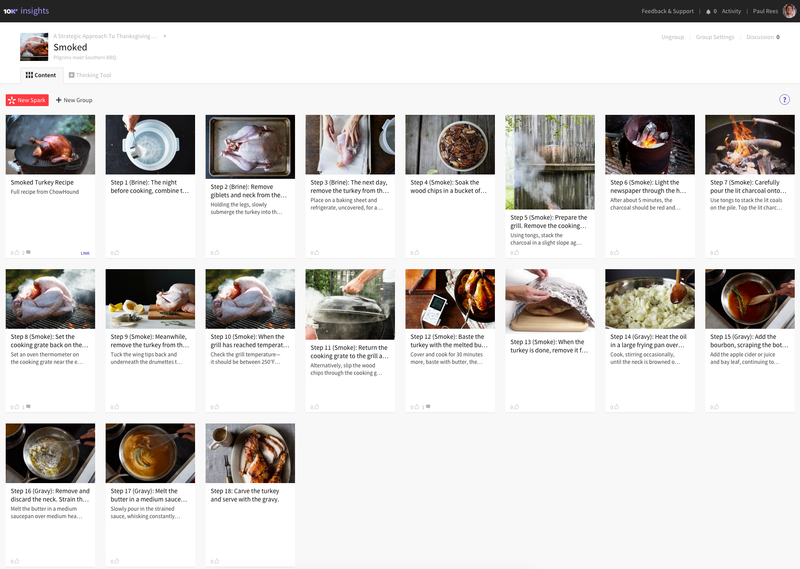 We made this project public for anyone to check it out and view the recipe ideas. You can view it here. 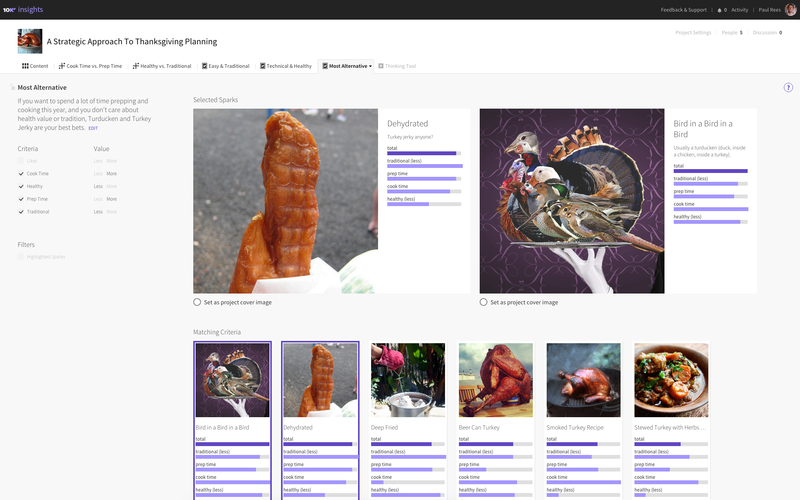 You’ll need a 10,000ft Insights account to view the project, but creating one is free. 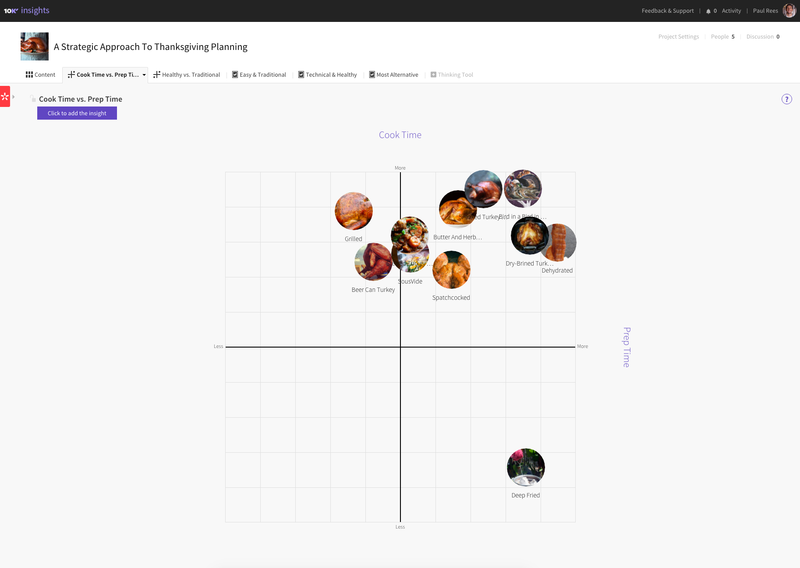 We realize this is an incredibly nerdy approach to planning Thanksgiving, (and there are far better uses of 10,000ft Insights than this) but once you get Turkey on the brain, it’s hard to focus on anything else. Do you have other ideas for evaluation criteria? Or want to see a what-if scenario we didn’t think of? Let us know in the comments! Makers of high-level project management software for modern teams. Writers of Hot Air, a blog full of perfectly reasonable advice on managing projects & teams.